Gears of Halo - Video game reviews, news and cosplay : Dead Space too scary a game? Dead Space too scary a game? 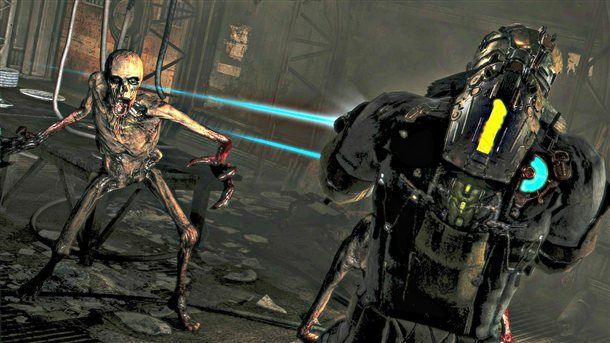 In some amusing propaganda / promotional talk for the forth coming Dead Space 3 game, marketing executive Laura Miele from EA said said research on the two predecessors to Dead Space 3 were "pretty scary" to play solo, and where a main reason why co-op was included in the latest installment. I say it's all talk (but the game is scary!) and that co-op is another tool to make the game play fun for friends! Miele was quoted as saying "We received feedback to understand how we can take the game out to even more consumers. We were hearing feedback that they love the thriller game, but it was pretty scary, and the obvious next step was that they wanted to play with someone. So we introduced co-op into the game." Miele went to assure fanboys that the inclusion of co-op for Dead Space 3 will not compromise the sheer terror that is a feature of the series thus far. I gotta be honest, I only recently got my hands on the original Dead Space game. So far it has it's moments.... full review to follow. I wouldn't say I've found the series to be terrifying thus far, but it certainly is exciting, and that's what I'm there for. Oh, and maybe just some swanky-looking sci-fi, cool tech, and laughing with Visceral over their Unitologist quasi-religion. Those silly Hubbologists. That must happen in the second game. On my current play through, I doubt I'll play the 2nd - would you recommend it? Galactus - pretty in pink? Tintin cosplay - like you've never seen before! Wanna see what Adrianne Curry wore to Comic Con? Iron Man cosplay fail. It's pretty epic. Is a Halo 2 remake on the cards? Paul McCartney has a date with Destiny? Halo 4's Multiplayer to be 8 gig in size? The Great Mass Effect 3 Bait and Switch?